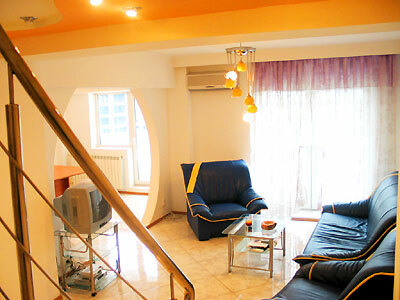 Rent Apartment in Bucharest with EastComfort. Our agency manages over 50 quality apartments in Bucharest. Select an apartment in Bucharest by price, the number of guests or by our recommendations. 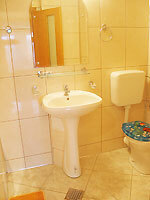 The Bucharest rental apartment is offered by Eastcomfort for short rent. The apartment equipped with modern convenience make this two story home the best choice for a big family or a group of friends travelling together. On the first level of this duplex, there are two rooms: a living room, gritstone covered, furnished with a glass coffee table, blue-leather armchairs and sofa, TV (more than 400 channels), separate study, large windows, and a restful bedroom. Upstairs, there are two bedrooms, each having full sized beds. The kitchen is equipped with large fridge, microwave oven, gas stove, everything you might need to have a tasty dinner, and washing machine. For each floor, there is a bathroom with modern basins, shower cabin and lavatories. The view is a precious memory from the Romanian Capital!